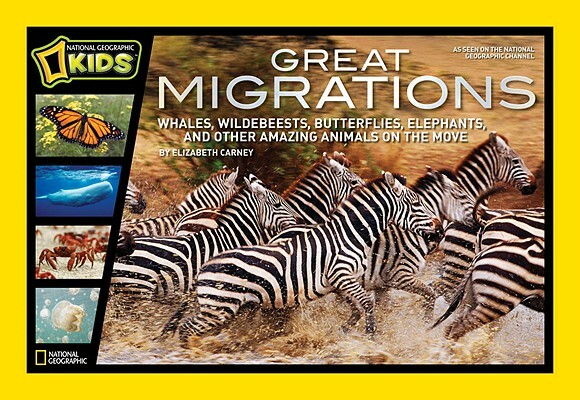 Great Migrations: Whales, Wildebeests, Butterflies, Elephants, and Other Amazing Animals on the Move by Elizabeth Carney. Grades 3-6. National Geographic Kids, 2010. 48 pages. Review copy provided by publisher. Each fall, kids notice birds migrating south for the winter. Geese make giant Vs in the sky as the days get cooler and the leaves fall off the trees. But there are many different kinds of migration and many animals migrate. Did you know that monarch butterflies migrate such a great distance that it takes them several generations to complete the journey? Did you know that there's a lake in the South Pacific where 10 million golden jellyfish migrate each day to follow the sun? Did you know that sperm whales can travel over 20,000 miles a year through the world's oceans? These facts and many more are included in Great Migrations, a companion book to the miniseries produced by National Geographic. Each animal represented in the book gets a stunning photographic spread, followed by an informational spread with facts about their migration. The informational spreads are laid out in a colorful and appealing way, using different font sizes and colors to emphasize information. A map is included, showing where in the world each animal is located and showing the animal's migrational patterns. The stunning photos will attract kids to pick up this book and it will make a great companion for students watching the miniseries. The book includes spreads on elephants, red crabs, monarch butterflies, golden jellyfish, zebras, army ants, wildebeests, and sperm whales, showing that migrations occur all over our planet and in many different types of animals. Kids who like books with facts about animals will enjoy this book and it'll make a nice classroom addition for units on migration or world animals. National Geographic Kids has also published a series of readers that accompany the miniseries, so those are worth seeking out! And check out more reviews of Great Migrations at Growing with Science and Reading Saves the Day. Great Migrations is on shelves now and the series will be re-aired next week, so check it out! Happy Nonfiction Monday! Head on over to Wild About Nature for this week's roundup! Reminder: AudioSynced is Coming Up! Books Make Great Baby Gifts!